It’s a beautiful Wednesday afternoon and I can’t help but reflect on how great this week has been so far. The kind words of someone you know (or don’t) can carry enough weight to make a significant difference in your life. Let me elaborate; Have you ever done something good and wondered what its effects would be or if the good deed would be passed on to someone else? Does it actually happen? A few months back immediately after the tragic events at Sandy Hook, I joined the “26 Acts of Kindness” pledge that swept the nation. In this, you committed to performing 26 random acts of kindness, inspiring the person interacted with to pass it on and brighten someone else’s day. I instantly wanted to be a part of this movement and started to come up with ways in which I can add some sparkle to someone around me, whether I knew them or not. I spent the next few months doing small things like: paying for the person behind me while getting my morning coffee (I did this 5-6 times, I’m an avid coffee drinker and support those who are too! ), cleaned off the random car next to me after a snow storm, let an elderly shopper in front of me in line and helped her unload/load her groceries and my favorite, was when my boyfriend Joe and I left a $26 tip on our $30 bill at dinner. This moment is particularly special to me, because the server chased after us to say thank you and Merry Christmas! 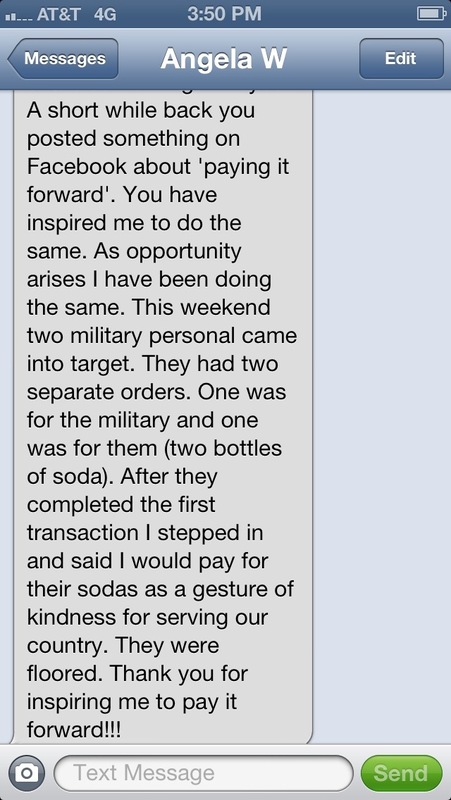 We began doing this at work as well, and some of my team members went above and beyond with their good acts. One put 26 candles and kind messages in random mailboxes around the neighborhood, another adopted a stray dog from Hurricane Sandy, one organized a snowflake drive for handmade snow flakes to be sent to the kids of Sandy Hook as they transitioned into their new school… (My Target team is amazing!!) just to name a few. While doing these 26 Acts of Kindness, you should try to educate the person you’re helping and encourage them to pay it forward. 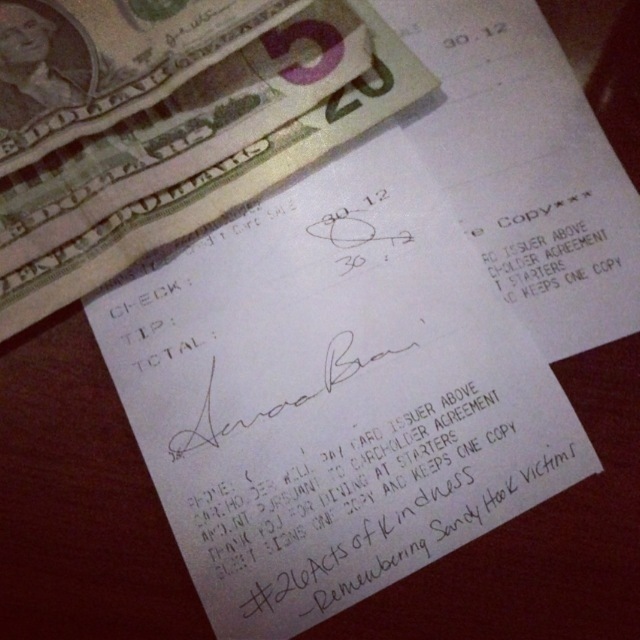 For example, this is what we wrote on the receipt to our server. The act of Paying It Forward is something I’ve always held dear to my heart, so when I knew it could benefit Sandy Hook victims and commemorate them in an amazing way, I was immediately inspired and wanted to spread as much positivity around this as I could. Around this time, I posted a lot on my Facebook page about how I would Pay It Forward and challenged my friends to do the same. Well, when I received this text on Monday, my heart melted. So the answer is YES. To the fullest extent to what is possible, yes. Whether its the same day, the following week, months later or years long after you’ve forgotten, good acts do get passed on and people want to Pay It Forward! It humbles me to know that we are all capable of making a difference. And while those military men make sacrifices everyday and would give their lives for our country, Angela made a significant difference in their day, and I have full faith that they’ll Pay It Forward the way she did.